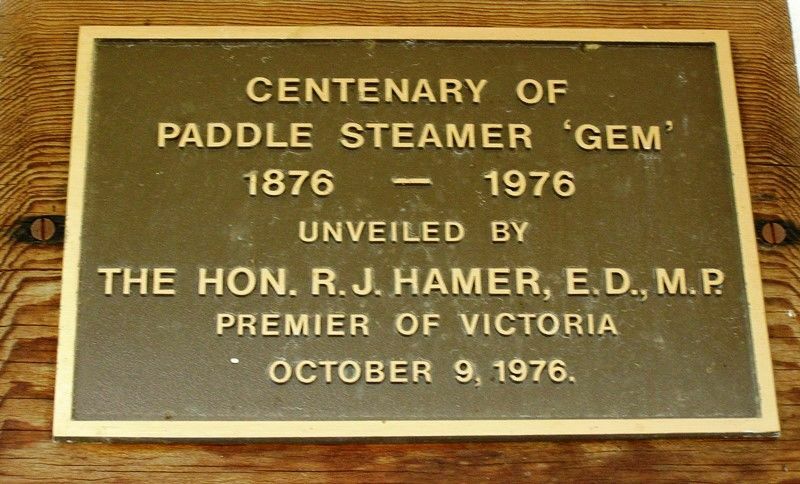 The plaque commemorates the centenary of the paddle steamer "Gem" 1876-1976. Known as 'the Queen of the Murray', she was built in Moama in 1876 as a barge having her steam engine installed at Moama the following year. In 1882 she was taken to Goolwa to be prepared for passenger service and there she was beached. She was sawn in half, by hand, and the two parts were pulled apart by bullocks to allow an extra one third to be built in between the two parts. In service, her lower deck was used for cargo, the engine, the dining room and galley; the middle deck was used for passenger accommodation while the top deck was used for the wheelhouse and to accommodate the crew. The Gem also had a Smoking Room at the rear of the upper deck for the men and a Music Room for the ladies at the front of the middle deck. The Paddle Steamer Gem was purchased in 1962 by the then Swan Hill Folk Museum and was towed to Swan Hill by the PS Oscar W, arriving at Swan Hill in July 1963. The expected ten day trip took eight months due to low river levels. Prior to that purchase she had had a long and sometimes checkered history.